We are seriously contemplating if we should add a new tag “astonishing” or “awesome stuff” because, we have seen some pretty mind-blowing stuff that people have created that deserves those tags. 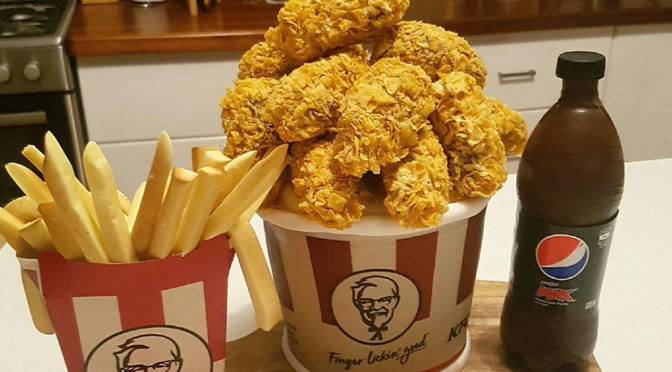 One such example is this: a KFC Bucket Meal, well, except that this ain’t no ordinary KFC Bucket Meal. The entire set, right down to the fries and the bottled Pepsi drink, was a cake. Believe it. Well, didn’t I tell you about it being mind-blowing. It truly was mind blowing. The cake set was the creation of an Australian ‘cake hobbyist’ who have shared her creation with a foodie group on Facebook. 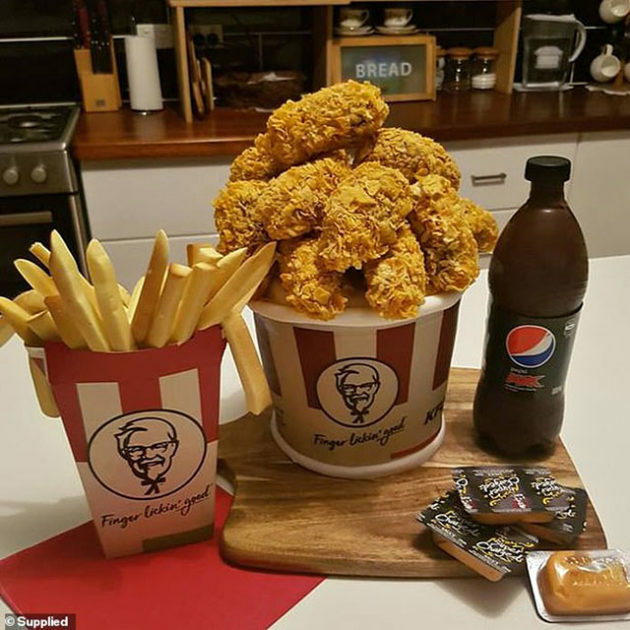 The cake’s resemblance to an actual KFC Bucket Meal was so uncanny that, at a glance, you will never think it was anything else. I am sure the result was well worth the 5-6 hours the 50-year-old grandmother spent on creating it. The bucket was actually a vanilla sponge cake covered with Bakels white fondant and wrapped with an edible image printed using an edible printer. 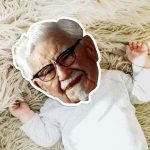 The “chicken pieces” were actually mud cake dipped in white chocolate and rolled in crushed cornflakes to achieve the crispy fried chicken look. 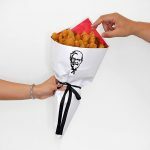 As for the fries, they are fondant too, airbrushed with a light dusting of yellow/brown coloring and then neatly placed inside an original French fries box from KFC. And oh, yes, the Pepsi bottle was a cake too, created using an actual bottle as a chocolate mold and finished with a real Pepsi wrapper to complete the look. 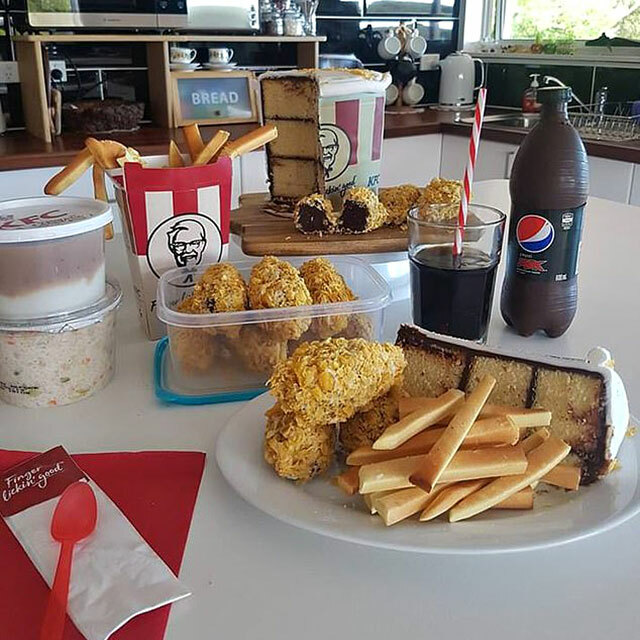 In case anyone has any doubt about this KFC Bucket Meal was in fact a cake, Munro has posted another photo that shows the cake sliced open. We are absolutely astound by this incredible custom cake creation. Images: Alice Munro via Mail Online. 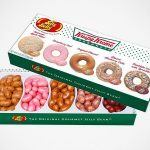 Jelly Belly Unleashes Krispy Kreme Donuts-flavored, Ermmm, Jelly Beans?